Well Suited for Receiver Testing, Noise Figure Measurements, or Applications which Require Broadband Noise and Fast Switching Times Several models include output isolators, and voltage regulators that provide excellent stability over varying temperature and voltage ranges. 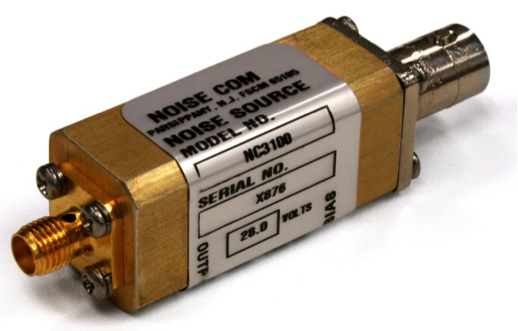 The NC 3000 Series includes the NC 3100 units with 15 dB ENR output for noise-figure meters, and the NC 3200 Series high output noise sources with outputs between 26 and 35 dB ENR for radar and satellite communications system testing. Input power +28 VDC at 30 mA max.